President Buhari has reacted to Thursday’s fire incident in Lagos , which left many people dead and several vehicles burnt. 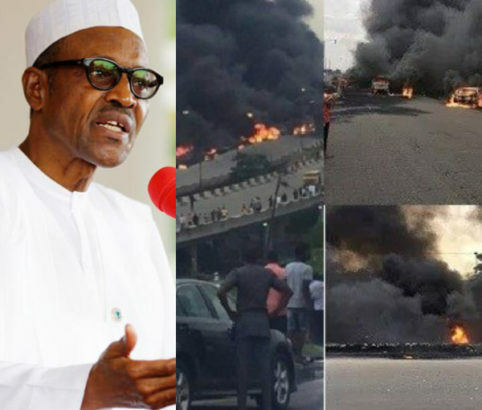 President Buhari who reacted to the incident through a statement issued by his Senior Special Assistant on Media and Publicity, Mallam Garba Shehu , in Abuja, on Thursday, sympathized with the Lagos State Government and the residents of the state. It has also been confirmed that no fewer than 54 cars and commercial vehicles driving behind the tanker got burnt in the fire incident, during which nine people were reportedly killed. Emergency management workers were said to have been mobilised to the scene, to rescue commuters trapped in the accident. Motorists, who made a U-turn and attempted to flee the scene of the incident, crashed into other vehicles. Lives were reportedly lost in the secondary accident that resulted from the confusion caused by the fallen tanker. He said, “I had just dropped off my passengers at Berger bus stop and turned to buy fuel. I was on my way back when I saw the tanker. All of a sudden, it tumbled and hit the median.